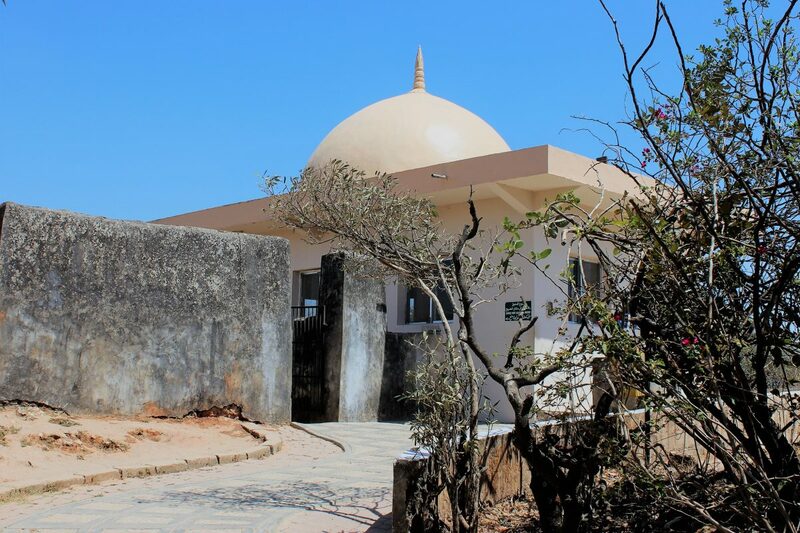 Join Abu Ayyub, travel writer and photographer, on his journey to visit what is believed to be the resting place of Nabi Ayyub (alayhi salaam), also known as Prophet Job in the Bible. Tucked away deep in the Qamar Mountains, one can easily miss the small cluster of white-walled buildings atop Jabal Ittin. 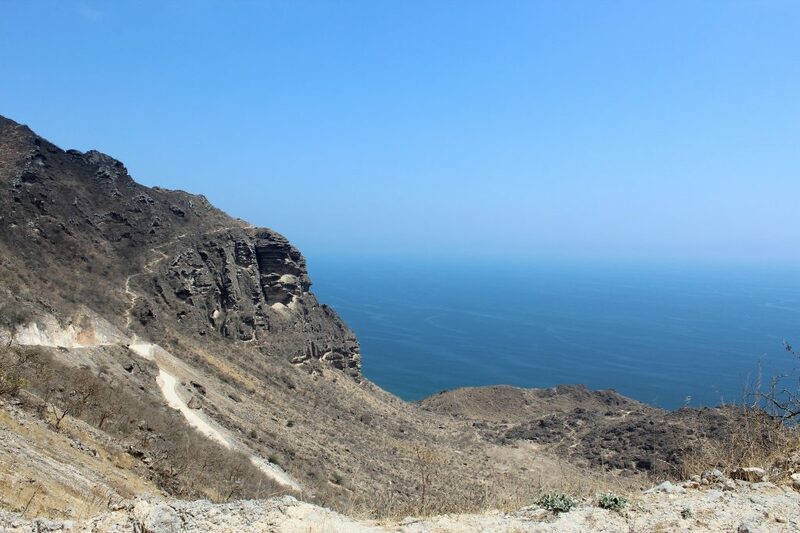 The drive is about 30 minutes out of Salalah, the second largest city in Oman, in the southern region of Dhofar. We reach a height of about 3000 feet above sea level, and leave the blue Indian Ocean behind us, driving through remote hills and valleys. 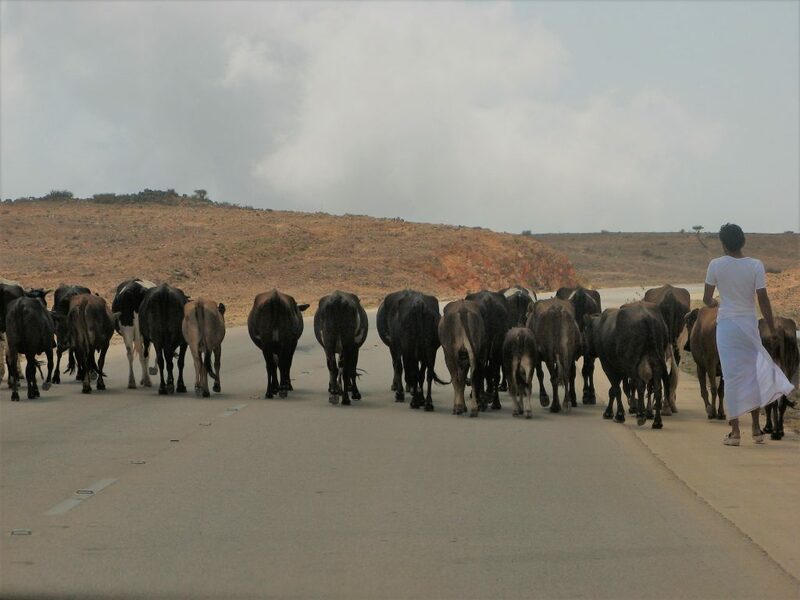 In these highlands, it is not uncommon to be slowed down by a lone herdsman walking his flock along the narrow roadways. As we begin to near our location, we pass a shabby looking restaurant. Two patrons stare at us with curiosity, their long curly black hair cascading from beneath indigo turbans. Each has a large knife tucked into his colorful izar (waist wrap) and they wear cross belts over their shoulders filled with cartridges for the rifles each of them carries. A single wave hello is enough for them to wave back and return friendly smiles. We are turning the last bend before our destination – a small gold-domed structure nestled on the summit. We pull into a parking lot which is empty save for some camels who have chosen this spot to sunbathe. We are now so close…I jump out of the car and head towards the gate that will lead me to this special location. The gate creaks open and we follow a footpath cutting through a garden of overgrown bushes of pink and red flowers. Midway through the garden, we meet the groundskeeper who is raking a dry flower bed; he gestures for us to keep following the winding path. The path stops. We are finally here. Here at last is the tomb of Nabi Ayyub (alayhi as-salam). The Quran speaks of Nabi Ayyub (AS) as being devoted to his faith in Allah, and steadfast in his patience. Tested to great extremes; he suffers the loss of his family, his wealth and his health, yet he remains faithful to his Lord. Allah, recognizing His servant’s patience, rewards him by restoring his health and blessing Ayyub (AS) with progeny and wealth. Next to his grave are the remains of an ancient mosque and the spring which gushed forth when he was ordered by Allah to strike the earth with his foot. Inside the building, we are the only ones there. A single grave sits in the centre of the room. 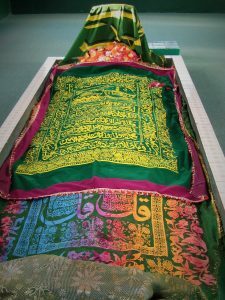 Over it is a green cloth, embroidered with Quranic verses and floral patterns. Someone has placed fresh flower petals on one corner. We greet the occupant of the grave and begin to recite Quran over it. The Prophet (Sallallahu alayhi sallam) encouraged us to visit graves to remind us of our own mortality and the Hereafter. While sitting in contemplation, our silence is interrupted as someone enters the room. 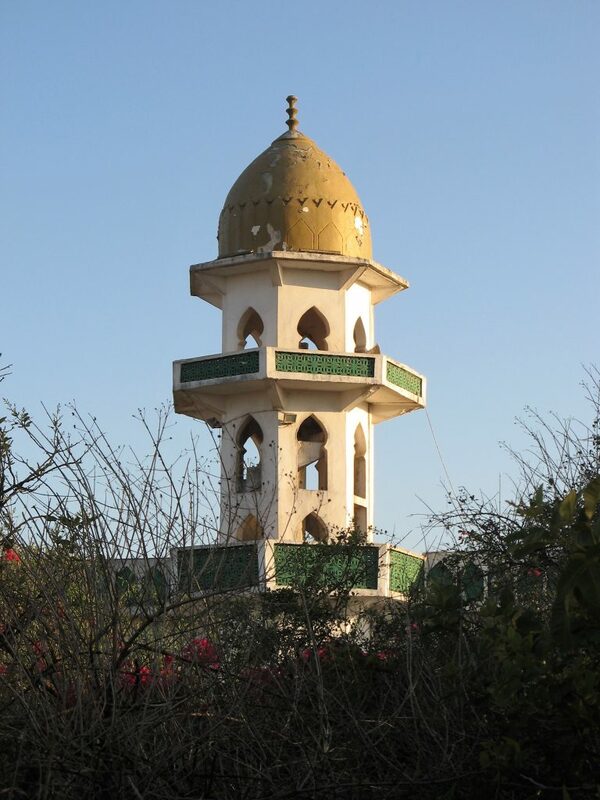 He seats himself at the head of Nabi Ayyub and begins to pray. It is time to go. We have accomplished the goal of our visit. On the way out, the groundskeeper acknowledges our visit with a silent nod of his head. As we begin our journey back towards Salalah, one camel followed by another crests the small hill before us, bringing our car to a complete stop. Soon a group of between thirty to forty camels pass us in long, slow strides. Once the road is clear, we make our way down the mountains to the Dhofari Coast and once again return to the blue of the Indian Ocean. Follow Abu Ayyub on Instagram where you can enjoy images from his travels, including many beautiful shots of Islamic architecture and local Muslims.